Field season is now underway and the first monarch eggs found by our research team are at the Iowa State University Sorenson Farm research plots east of Ames. 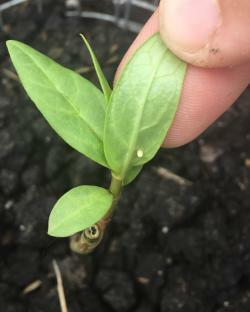 On May 24, 2016, five eggs were found on small Asclepias incarnata (swamp milkweed) plants and six eggs were found on Asclepias syriaca (common milkweed). Researchers with the ISU Monarch Workgroup are busy with field activities that include updated summer research objectives, newly hired interns, and greenhouse benches filled with milkweed and companion plants. Check back for more research news as the summer progresses.